Upon graduation from Denver East High School, I interviewed with the Army Recruiter. I then went home and told my Dad, who was career Air Force MSGT (WWII and Korea Vet), that I was going to sign up for Ranger Training in the Army. The next day he went with me to the recruiters’ offices and introduced me to the Marine Corps Recruiter, who was a friend of his and also WWII and Korea Vet. The two of them took me down the hall to the Coast Guard Recruiter where I saw a picture of a Coast Guardsman on a horse on the beach with a dog alongside and rifle slung over his shoulder. 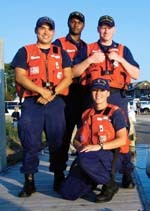 Between the two recruiters and my Dad they convinced me the Coast Guard was the best service to join. I should note that after joining until retirement 24 years later, I never regretted the decision and I never saw a horse, the beach or the dog. Just the rifle, which I became to know well in Boot Camp with it over my head. I joined the Coast Guard on July 5, 1961 and arrived at Government Island (now Coast Guard Island), Alameda, CA that night after taps. The OOD showed me to a bunk and said fall out at reveille in front of the building. Reville came and I fell out with the rest of the recruits that morning. I don’t remember ever having seen fog before and it was so thick you could not see across the street. They marched us to the mess hall and after that to the barber shop. By then the fog was lifting and I became less disoriented. During boot camp, I got used to “high port” due to slamming the M-1 receiver shut on my thumb a couple of times and other offenses. I had played football, basketball and ran track ( hated sprint drills then) for 3 years in high school. But boot camp managed to build some more muscle. 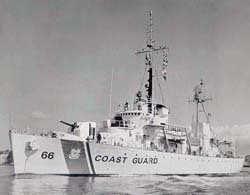 After boot camp, was assigned to USCGC Klamath (WPG-66) home ported in Seattle. Spent the next 7 years on board the Klamath. Went from deck force to quartermaster striker thru Quartermaster First Class. Made First Class in less than 3 years. Having been raised in a military family, I was already committed to making the service a career. After so much time on sea duty pulling Ocean Station November/Papa, Alaska and Bering Sea Patrols, I had the bright idea that if I went to OCS, I could get out of sea duty. 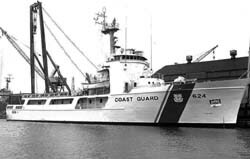 About that time, I was transferred to USCGC Ivy (WLB-329), a old Army Mine Layer. Having to stand Underway OOD watches, helped confirm: I should apply for OCS. I did not participate in combat. Closest I came was in 1972, I had just sailed as First Lieutenant/Deck Department Head on the Taney (WHEC-37) from Alameda, CA to Little Creek, VA. Not too long after being there, I felt a hankering for some Mexican Food. Well, I went looking and discovered that not only were there no Mexican Food restaurants but there was not even a Taco Bell. So, I called my detailer and asked how I could get back to where there was Mexican Food restaurants. He told me that he had no openings in those areas, currently, but if I wanted to take an assignment in Vietnam, he could guarantee me an assignment back on the West Coast. So, I got orders to Vietnam via SERE Training. I checked in at Government Island and had just put my car, a 1972 GTO, in storage and to pick up my tickets to SERE training when admin told me that my detailer called and wanted me to call him. I called and he informed me that the Coast Guard was being pulled out of Vietnam and asked where I would like to be stationed. I asked what was available in the area and he told me about a new type of unit being formed for Vessel Traffic. I had no idea what it was all about but, it was in San Francisco and there were very good Mexican Food Restaurants in the area. I was assigned to Harbor Advisory Radar, located at the end of Pier 44 1/2 (directly next to Fishermen’s Wharf in San Francisco.) Within the year we moved to the top of Yerba Buena Island and became San Francisco Vessel Traffic System. Spent over two years there living in the Bachelor Officer Quarters on Treasure Island (just down the hill from the VTS). I was promoted to Lieutenant and later received orders to USCGC Dauntless home ported in Miami Beach, FL. I was Operations Officer and Senior Boarding Officer on the Dauntless and received two personal citations while assigned to her. During that time we conducted numerous drug and alien interdiction missions in the Caribbean, Straits of Florida, Gulf of Mexico, vicinity of the Bahamas and off the coasts of Georgia and South Carolina. Also, went to REFTRA at Guantanamo Bay, Cuba. While the ship spent 4 weeks in the ship yard, I was assigned to CG District Seven, Office of Intelligence and was tasked with drafting a new Law Enforcement Manual (Annex) to the CG District Seven Operations Plan. I was then assigned to CG District Twelve as Assistant Chief of Search and Rescue and Senior Watch Officer of the CGD12/COMPAC Area Joint Operations Center. 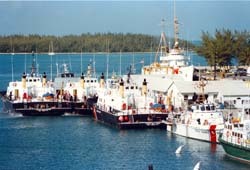 After a couple of years there, I was assigned to Coast Guard Surface Effect Ship Division (CGSESDIV), Key West, FL. I was assigned as Commanding Officer, of CGSESDIV. Which would eventually consist of 3 Coast Guard and 1 Navy Surface Effect Ships, 4 Coast Guard crews, 1 Navy crew, a Coast Guard support staff and a Coast Guard Law Enforcement Detachment. We not only had operational missions in military readiness, search and rescue and law enforcement but also, charged with research and development for surface effect ships. 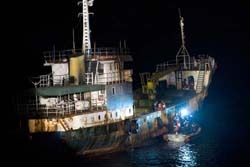 The CGSESDIV set a record for the most law enforcement seizure in the Coast Guard at that time. During the Granada Invasion, the division was given deployment orders and did deploy 3 SESs but, by the time they got to the Windward Passage they were recalled. You may not have noticed but twice, I was involved in orders to a combat area and each time never reached the area due to recall by the Coast Guard. During my early enlisted years in the service, I spent most of my time on board USCGC Klamath (WPG/WHEC-66) home ported out of Seattle. 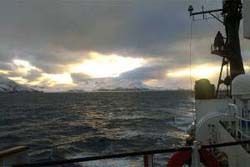 We spent most of our time either on Ocean Stations November or Papa, Bering Sea Patrols or Alaska Patrols. We conducted security patrols off of Amchitka Island around the time of the Underground Nuclear Test. I did spend about 8 months on board USCGC IVY (WLB-329) home ported in Astoria Oregon. 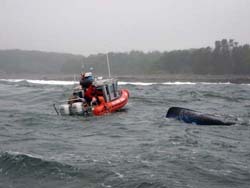 We conducted coastal buoy maintenance and replacements and did go on one two week oceanographic mission off Vancouver Island, Canada (partially during a full Gale). It was a challenge trying to maintain station without getting the oceanographic array caught in the screws. I have the fondest memories of being assigned to the CG Surface Effect Ship Division in Key West, FL and the CGC Dauntless in Miami Beach, FL. For one reason, you could not beat the weather or excitement there. Lots of sunshine, beaches, warm and calmer seas. Every day was a different mission. You never got bored. Being Commanding Officer of the CG Surface Effect Ship Division, gave me exposure to managing risks and coordinating a multitude of tasks and solving problems. Most importantly, was the association with the finest officer and enlisted men, I ever served with. I can’t describe a least favorite duty assignment because each one had it’s own challenges and rewards. I would not trade or change any of it. My assignment as Operations Officer on board CGC Dauntless where I was first exposed to the high tempo of operations and risks of law enforcement boardings. I will also, forever the many helicopter flights I made of the ship in the co-pilot’s seat. I will always remember my first wife, Francine, being shot and subsequently dying while I was on patrol near the Bahamas. During that time I was not given an opportunity to fly to her side in Seattle until just before she died and was given only a couple of days to make arrangements for my daughter, Laura’s care. I remember the challenges of getting remarried to a superb lady as my wife, Gayle, with 3 preteen sons (Michael, Richard & Jeffrey) and merging my preteen daughter (Laura) into one family. Not to lessen the experiences of moving twice across country and both times into government quarters, In those days, there were no 4 bedroom duplexes available of junior officers. I was Operations Officer and Senior Boarding Officer on the Dauntless and received two personal citation while assigned to her. One was a Coast Guard Commendation Medal with Operational “O” for serving as senior member, boarding Party, and Commanding Officer, Custody Crew in the seizure of the M/V Night Train with her 52 tons of Marijuana (largest such seizure at the time). Night Train attempted to ram the Dauntless and refused to heave to after Dauntless fired 3 burst of .50 cal. MG fire across their bow and subsequently hove to after Dauntless fired 3 rounds from her 3″ deck gun across their bow. 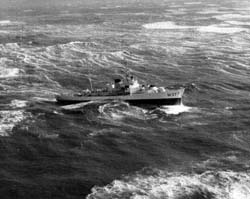 The other was a Coast Guard Achievement Medal with Operational “O” for serving as Operations Officer and subsequently, leading a seven man boarding party onto the 184 foot Panamanian coastal freighter Kaki in total darkness and heavy seas, after having pursued the vessel for 200 miles to seaward. While assigned to Coast Guard Vessel Traffic Systems, San Francisco, the unit received the Coast Guard Unit Commendation Ribbon. While assigned as Commanding Officer, Coast Guard Surface Effect Ship Division, Key West, the unit received two Coast Guard Unit Commendation Ribbons with Operational “O”s. Qualifying as an underway OOD as an enlisted man on a buoy tender. BMC who was in charge of the deck force on the Klamath encouraged me to strike for Quartermaster. LT who was the Operations Officer on the Klamath and encouraged me to go to Navy Signalman School so I could strike for Quartermaster. LTJC who was the Operations Officer on the Ivy and encouraged me to apply for Officer Candidate School. LT who was the Operations Officer on the Avoyel and mentored me as an Ensign. Captain Ogin who was the Commanding Officer of the Taney and mentored me as a LTJG. CDR who was Commanding Officer of the Coast Guard Vessel Traffic System, San Francisco who show confidence in my suggestions. CDR Iken who was Commanding Officer of the Dauntless and who showed confidence in my law enforcement expertise. CDR Bill Haugen who was Chief of Search at Rescue for Coast Guard District 12 and who mentored me in staff officer etiquette and responsibilities. Captain Alan Dempsey who was Group Commander of Coast Guard Group Key West who mentored me as commanding officer. The Chief Boatswain Mate assigning me to use the air powered needle gun (used for removing paint) to the underside of the bridge wing on the Klamath when I had a hangover. Wasn’t funny then but taught me a lesson I’ll never forget and I can smile about today. I earned my California Real Estate Salesperson License while I was still on active duty and in first year with my license, I was named Rookie of the year by Better Homes Realty Northern California. The following year I was recognized by the same company for two million dollar in sales. This was when homes were selling for $100,000. Two years later I earned my California Real Estate Broker License and became a partner in Castle and Associates. I also, served on the Board of Directors for Northern Solano Association of Realtors and was on the Committee for Regionalizing the Multiple Listing Service of Solano, Northern Solano, Marin, Napa and Sonoma Counties. It was the first regional MLS in the nation. At the end of 2004, I semi-retired for real estate after 24 years as CEO, President of Castle & Associates, Inc. For the next 3 years, traveled. In 2008, I went back to work as a Veterans Service Representative for the Veterans Benefit Administration processing claims for compensation and pension. by 2011, I had been certified and promoted to GS-11. I retired from this job in 2013. 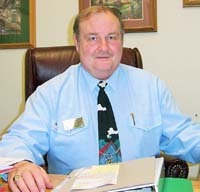 I am now still working in real estate and I volunteer as a SCORE (senior counselor of retired executives) which is supported by U.S. Small Business Administration as an email mentor. I also, volunteer with TogetherWeServed. I do some volunteer work for the American Legion and Military Officers Association of America. Life Member of U.S. Navy League -stay up to date on national maritime issues that the nation faces. Military Office Association of America – stay up to date on matters effecting active duty, reserve, national guard, retired and spouses. American Legion – stay up to date on matters effecting active duty, reserve, national guard and surviving spouses. Coast Guard service taught me the importance of Honor, Respect, Devotion to Duty, Due Regard for Rights and Privileges of Others, Endeavor to be a Model Citizen and bring solutions not just problems. First, congratulate them on making one of the best choices of their lifetime. Reinforce their brave choice to pick a service that is not only a member of the armed services but also, has many missions that are important to our nation and the world. If they work hard and constantly try to improve their knowledge, they will succeed beyond their imagination and will reap rewards beyond pay and promotion. It has propelled me into assembling much of my Coast Guard Memorabilia and think about my service so long ago. It has helped me locate some old shipmates and brought back some memories. Most important, it has allowed me by filling out my reflections questionnaire to put my memories in chronological order. It also, has brought back some of that “can do attitude” and sense of pride. Mr. Council, I was with you on the Dauntless and the Night Train bust. We were on Ivy together and were neighbors in off base housing. Good times!